If you decide to get a paid subscription to Ancestry.com, it gives you an additional feature of the online family tree that is worth mentioning — Member Connect. 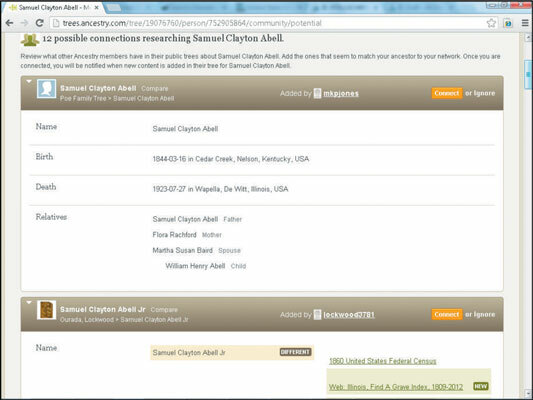 The Member Connect feature actively looks for other people who are posting information about your ancestor on their online family trees. After finding a potential match, Member Connect lists the member’s name on the tab. Display your family tree and then open the profile for which you want to search for member activity. Select the Member Connect tab to see possible connections for this ancestor. To contact another Ancestry.com member, click the user name next to the Added By title. Then click the Connect button and type the subject and message. Clicking the Send button sends the message directly to the user. You must be a subscribing member at Ancestry.com to contact another member. Ancestry.com subscribers see links to the family trees containing the related information about the ancestor. Nonsubscribers see only the number of records, sources, and photos available on that family tree.